The remodel involved adding 13,500 square feet of extra space, including 8,000 square feet of sales floor. Every part of the store was impacted at some point, with the entire store getting rewired and plumbing updates, said Tracy Dilworth, but they miraculously managed to stay open through the entire six to seven month process, at times having to close or relocate departments and the loading area. The toughest weeks were during the facade rebuild, but overall foot traffic and customer count stayed steady, said Dilworth. “The MVP in the remodel has been the staff. They stuck with us through thick and thin, all the inconveniences. We literally kept our staff intact and added about 22 percent more staff,” he said. Once all the finishing touches were in place, the store celebrated with a week-long grand re-opening and tasting event, where they brought in vendors, gave out lots of samples of new signature items, and held prize drawings. “During that week we had record sales and record traffic. And overall since then customers have been very receptive and sales are up 25 percent,” Dilworth reported. The driving force behind the remodel was the desire to emphasize Dill’s fresh, local offerings, scaling up the perimeter and trimming back on center store. As a result, the Dilworths make it a priority to buy and support local, and host several events throughout the year to highlight local and regional products. The most popular are locally-sourced truckload meat sales and an annual tomato event promoting the first regionally-grown tomatoes of the season. For both events they put signage throughout the store to maximize shopper awareness and also prep team members so they can talk in detail about the products and producers. In addition to the physical changes recently undertaken, the team at Dill’s also makes sure to keep up with changes in the digital realm. “We’re constantly looking for new ways to market and promote the business to attract new customers,” said Dilworth. In business for three generations, the Dilworth family is building on decades of growth that started in 1935 when C.D. 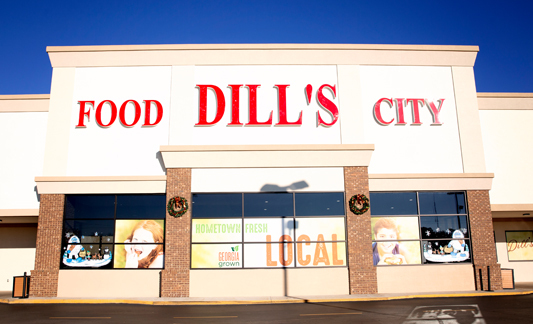 Dilworth built a 500-square foot wood slat structure in rural Red Hill, GA. More than 83 years later, Dill’s Food City has grown to more than 150 employees, and the Dilworths were one of the 2018 IGA Hometown Proud Retailer finalists.